Debut album "Something's Gotta Give" features some heavy hitting blues Detroit style. Co written and produced by Motor City Josh. Powerful vocals with an Albert King meets Wes Montgomery guitar style Paxton proves he has a lot to give to the Blues. High energy contemporary blues with a Detroit influence. 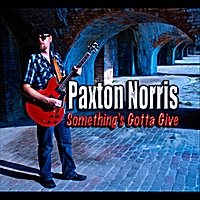 Paxton Norris' debut CD "Something's Gotta Give" is the product of being born and raised in southern Michigan. Soulful vocals and polished guitar lines reminiscent of the Motown era. Backed by a hand picked rhythm section of the hottest players on the blues scene this album has a nice mix of original songs and a couple choice covers. Freddie Kings "My Credit Didn't Go Through" and a rearranged version of Bobby Blue Bland's "Love Light". National artist Motor City josh, Victor Wainwright and Tyler Mac add their flavor on "That Woman's Trouble" and "These Funking Blues". Taking his queues from BB.King, Albert King, MCJ and Wes Montgomery Paxton proves he has a lot to give.